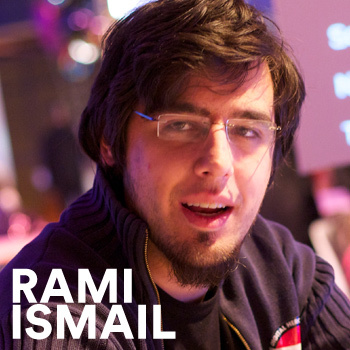 Rami Ismail is the Business & Development Guy at Vlambeer, a Dutch independent game studio known best for Wasteland Kings, Ridiculous Fishing, Super Crate Box, LUFTRAUSERS, GUN GODZ, Serious Sam: The Random Encounter & Radical Fishing. At his upcoming 2014 D.I.C.E. Summit talk Rami will present on “No holding back: A look at independent game development during three years of Vlambeer.” Rami discusses The Golden Age for independent development, running through the last five years as he learned of the independent gaming scene, founded Vlambeer with co-founder Jan Willem Nijman, and slowly worked his way into a central figure in independent gaming. He will discuss lessons learned and applicable to an ever-changing scene, the importance of technological democratization and the shift in the relation between developers, platforms, consumers and partners. I'm playing Animal Crossing: New Leaf, Persona 4: Golden and Zelda: A Link Between Worlds. You'll notice all of those are handheld titles, and that's because I'm traveling pretty much continuously nowadays. I've been waiting for The Iconoclasts forever, and I still can't wait for it to come out. It's a one-man project by the Swede Joakim Sandberg that just breathes love from all its tiny details. Blendo Games' Quadrilateral Cowboy is another game that I'm looking forward to a lot, as Brendon Chung always manages to mesh narrative and gameplay together so well. This heist simulator with a heavy focus on hacking seems to be no different. Last year SUPERHOT introduced an amazing little gameplay mechanic that I thought was brilliant during the 7 day long development challenge that is 7DFPS. Save the Date did something really cool in terms of narrative that I absolutely did not expect. I can't answer that really, because so many books have had influences on my process. Science fiction books -specifically the awful ones that mention double black holes and spacetime folds on the back- have always been a favorite of mine. I recently read Karl Schroeders Ventus at the recommendation of a friend and some of the concepts introduced in that book really stuck with me. On one side, I'm a big fan of Vonnegut, Asimov and Hebert - on the other I can really get into dry philosophy or religion, mythology or history-related books. Currently that is the Glasgow synthpop formation CHVRCHES. I've been hooked to their music since Recover EP, but since I went to a gig of theirs in Boston I've been a big fan. I also really like Stromae's music, with Papaoutai being a favorite of mine. Sometimes I'd rather relax a bit and I end up listening to I've got a pretty eclectic taste, and Jan Willem -the other half of Vlambeer- always finds the weirdest nice music to listen to. Vine. I can't stop using that for some reason. There's something challenging about the limitations it provides. Depends on your definition of home. I spend so much time in airplanes that a PlayStation Vita and Nintendo 3DS would be a valid answer. At 'home' I have most consoles, a laptop and a Macbook Air added to that. I usually travel with a bunch of Xbox controllers around, so I can play Towerfall and Samurai Gunn where ever I am. I am a big fan of a small Philips Picopix 3610 I bought a while ago, a mini-beamer that turns pretty much any space into a nice gaming space / cinema, but the winner is the Karma. It's a tiny 3G wifi hotspot without data plans and a really cool way of earning free data by letting others connect to your device and it works in most mayor US cities.